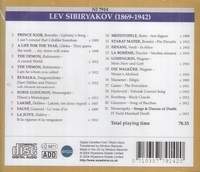 "Lev Sibiryakov was one of the greatest bassos of the 20th century, and one of the greatest singers to make records. He brought to his art an extraordinarily solid, evenly produced bass voice, rich in color and uniquely smooth in emission. I cannot think of a bass with a more perfect legato. The voice was strong at both ends, with a thrillingly impressive top."